I was recently involved in a city-wide campaign orchestrated by San Francisco Transit Riders that got the attention of 30+ media outlets, and may have changed our politician’s relationship to our local public transit, affectionately, if generically, called Muni. We could not have done this without Twitter, our supporter, our advocate, our viral marketing friend. Please use the steps outlined below to help build your own public outreach campaign primarily with social media and volunteers. 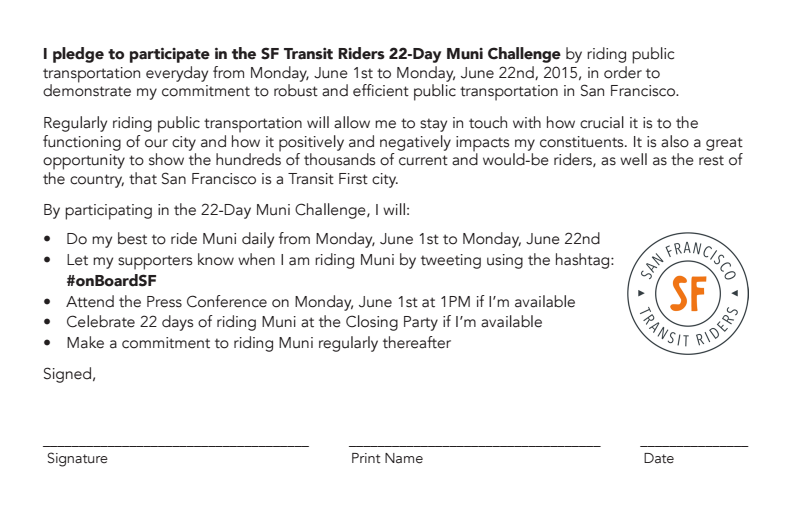 It was called the 22-Day Muni Challenge. In this blog I put my marketing and public outreach hat on to give you the Eight (8) steps to challenge someone to make something better. 1. Get an idea. In our case, we found out that, 22 years ago, legislation was passed that asked public officials to ride Muni at least 2 times a week to and from work. It was never enforced and in spite of a lot of hard work by the author of the resolution, it sunk into obscurity. That’s how we got the 22 days part of our challenge. 2. Make it do-able. 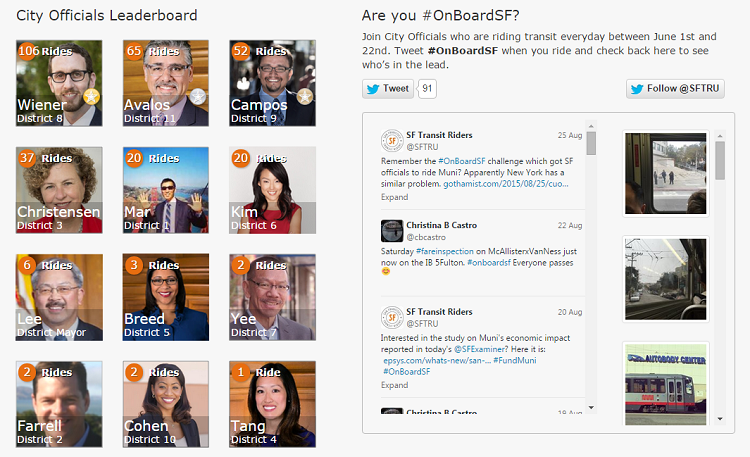 We asked our public officials to ride Muni for 22 days; to use a hashtag, #OnBoardSF, so we can track it (thank you, Twitter); and to take pictures, because it’s more fun for everyone. Selfies extremely acceptable. 4. Let lots of people know. We had our volunteers (who were absolutely critical to this scrappy effort!) call our members and supporters the day before the press conference to ask them to show up. That same night, we made awesome signs for people to hold. Result: it looked GREAT and we got over 8 articles before or at the first day of the 22 Day Muni Challenge. 5. Show results during campaign. We had a leaderboard to show how many times people rode the bus. Each Supervisor and the Mayor were on the leaderboard and their efforts were shown. See below for the final results, with the Twitter feed next to it on the Transit Riders website. 6. Do something during the Challenge. While the public officials were tweeting and riding Muni, the Transit Riders were devising a question to hand out to Muni riders “What would you do to improve Muni?” We also took the question digital and asked people via social media and on the website. 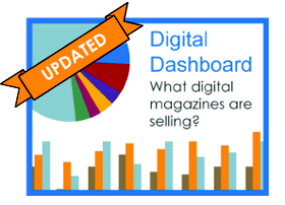 We compiled the answers and let everyone know about them at the closing event. 7. Have a party at the end! Julia Child says a party without cake is just a meeting. We say a campaign without a celebration is just…well, a campaign without a celebration. Supervisors came to receive their prizes, food was donated and eaten, drinks were drunk, and speeches were speeched. Awards included: Most Distance Traveled, Humble Hero, Most District Rides Taken, Eyes of Equity, Taking One for the Team. 8. There are no losers! The philosophy behind the Challenge was to make a positive experience for the politicians, to get them public awareness as a result of being a part of it, to get them “OnBoardMuni.” With the help of Twitter, a lot of volunteers, and a willing media, we managed to do just that. 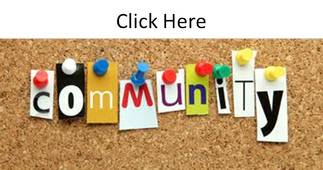 Find more public outreach suggestions in my blog on Public Outreach That Works - 5 New Rules.